Redhill watch out - Andy's about! 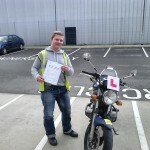 Haha, Andy Palmer proudly showing off his A2 motorcycle test pass, and why not! Well done there Andy, now back to your new place in Redhill to start ebay hunting for your own motorbike huh?